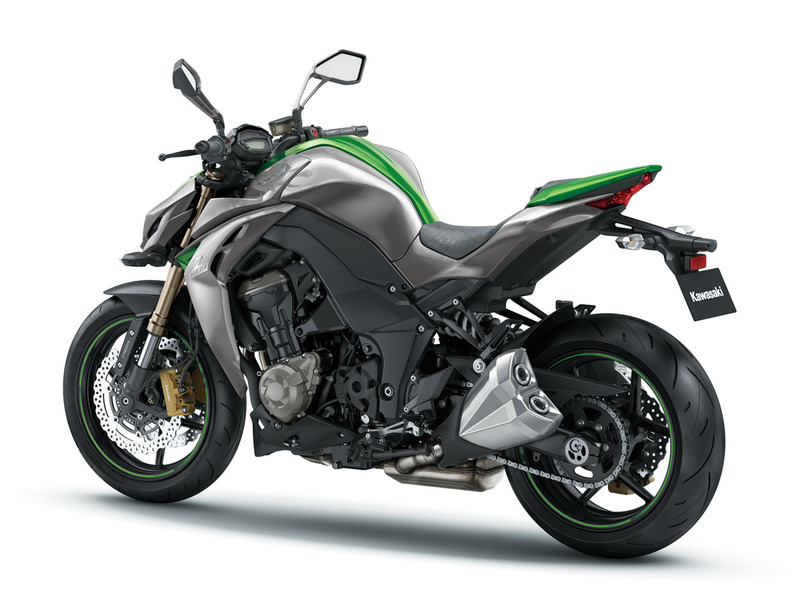 Having tested the awesome 2013 Z800 last year I was keen to check out the bike’s bigger sibling and see just what was on offer in the big bore naked category from Kawasaki – or in their own words the ‘supernaked’ category. 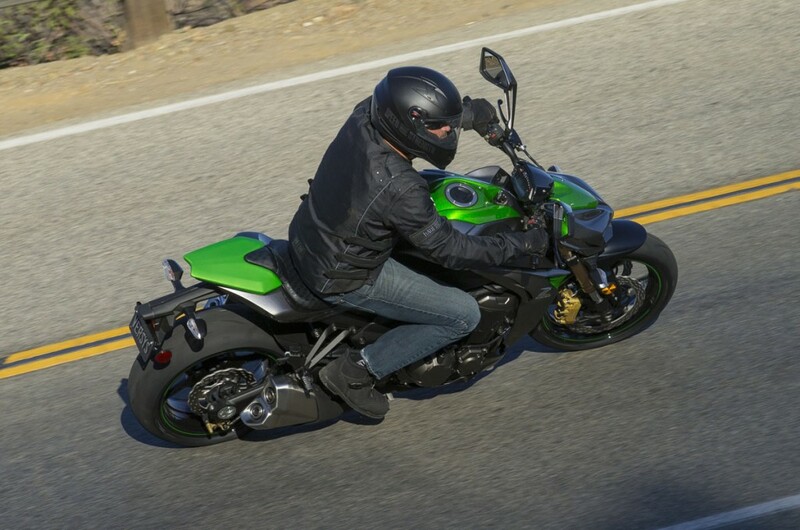 The 2014 Z1000 is one mean looking machine, leaving the older model in its dust from a styling perspective in my opinion. The old Z1000 might have been brooding and intimidating but this new model takes that to a whole new level, with bodywork that flows from tip to tail and attitude that hits you like the slap in the face when your significant other finds out you bought one without asking. Kawasaki call this new approach to styling ‘Sugomi’ – going for a more naked approach than previous models, with cleaner lines, smaller bodywork features and a more integrated overall theme. Now ‘sugomi’ is the Japanese word to describe an intense aura or energy, or feeling of greatness given off by an object or person, inspiring awe and leaving an impression. Looking at the Z1000 it’s hard to argue that they didn’t achieve their goal, with a front headlight that is smaller, sleeker, meaner and more evil looking and incorporating reflector-less LED lights for great vision at night, as well as low slung indicators. The instruments are clear and easy to read, although the digital tachometer is a little on the strange side, starting on the digital display for the first 3000rpm before continuing on a separate gauge that sits above the regular display and which lights up from left to right with bright white lights to represent higher rpm. Indicators and warning lights sit on either side of this panel though, in an ideal position to notice when you’ve left a blinker or your high beams on! Apart from this little quirk though the dash is easy to read, combined with easy to use controls situated on aluminium fat bars and boasting new mirrors, which are both sporty and provide good vision, although on this model one mirror was completely vibration free while the other suffered from them quite badly – perhaps due to over tightening. 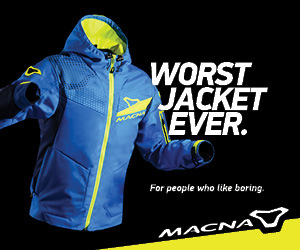 The sporty lines of the bike continue from the headlight across to the tank flawlessly, while the radiator guards/fairings are smoother and less pronounced than the previous version, offering a more elegant solution, with a much smaller bellypan-esque fairing that is both a cleaner and sharper change. The larger 17L tank provides additional potential mileage before continuing back into the tail unit, while side panels have been made redundant thanks to a redesigned sub-frame that is just visible where the pillion pegs bolt on. 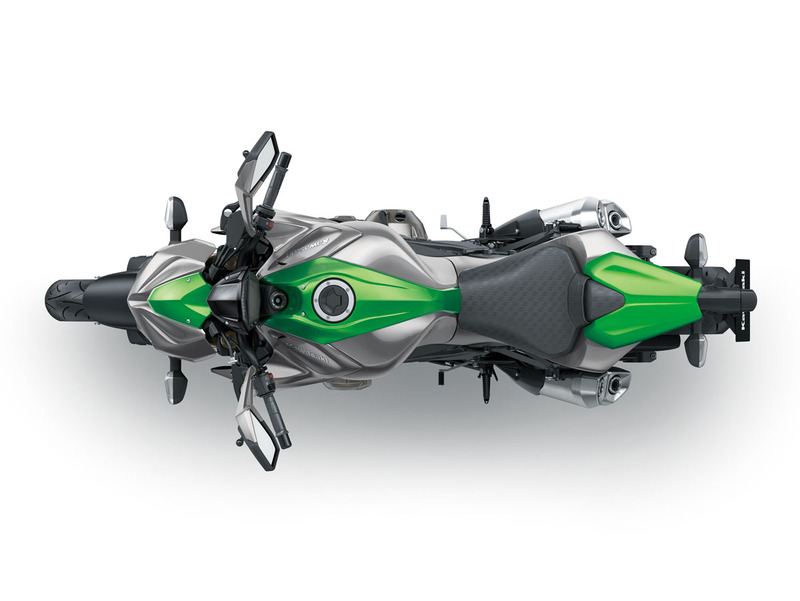 The pillion seat like the Z800 from last year uses a metallic green material which is easily mistaken for a seat cowl and is integrated into the seat, while a LED taillight provides those behind you with all the notice they’ll need on your activities – if they can keep up! Like the rest of the bike, the exhausts have also been cleaned up with a much less pronounced lower heat-shield hiding the four-into-two-into-pre-chamber-into-two system, while the mufflers are a single piece affair without the added clutter of a separate cap. 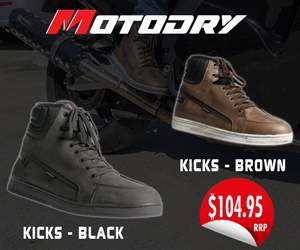 Add in small details such as the Z-embossed seat, longer and more aggressive licence plate holder, removal of the fork covers and exceptional build quality and you have an absolute winner in the looks category. Of course there is a lot more to a bike than just looks and the Z1000 certainly delivers in the performance arena as well. 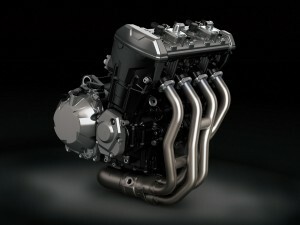 There are a few revisions for 2014 but it is not a new engine. These include downdraft throttle-bodies and revised intake funnel lengths (four long funnels, instead of the previous two long, two short) for a stronger mid-range. 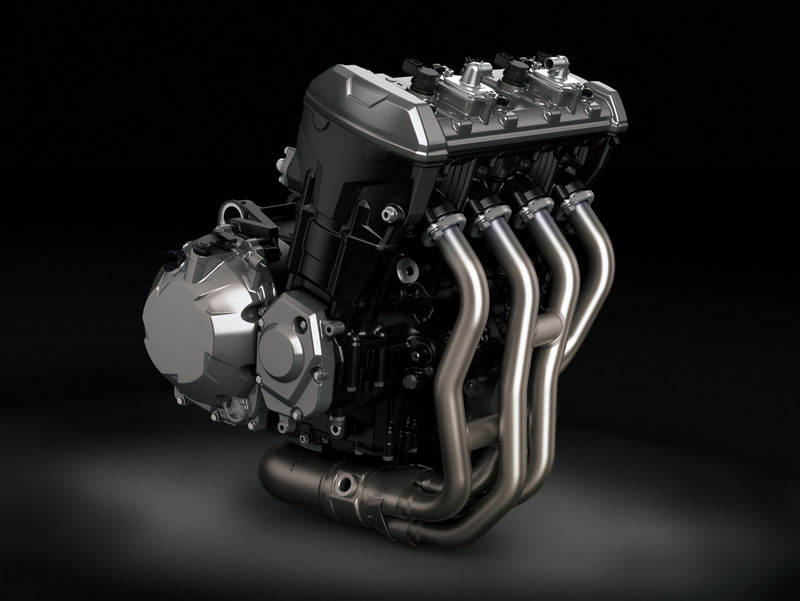 Dual throttle valves with oval sub-throttles combine to provide manageable power while maximising airflow, assisted by the intake ducts built into the radiator fairings. The 1043cc 16-valve in-line four created 123hp and 74ft-lbs of torque on the dyno at Sydney Dyno with torque really ramping up between 2000 and 3000rpm, while power climbs steadily all the way to just past 10000rpm, providing predictable and strong performance throughout the rev range. A throttle-body bore of 38mm was chosen for low to mid range response, while connecting passages between cylinders were implemented to reduce pumping loss and assist high rpm performance, with revised lift and operating angle for the cam to 8.5mm maximum lift and 270 duration, again aimed at low to mid range performance. Gearing was also tweaked, adding a tooth on the rear for stronger acceleration, while the sixth gear ratio was amended in order to retain the previous overall ratio to allow for highway use in comfort. The ECU received all new settings for the new model to ensure throttle response was as direct as possible as well as providing an exhilarating ride. A secondary balancer was added, driven off a gear on the sixth web of the crankshaft helping to reduce vibrations, while still maintaining the level of feel and connection between the rider and motorcycle – quite successfully. 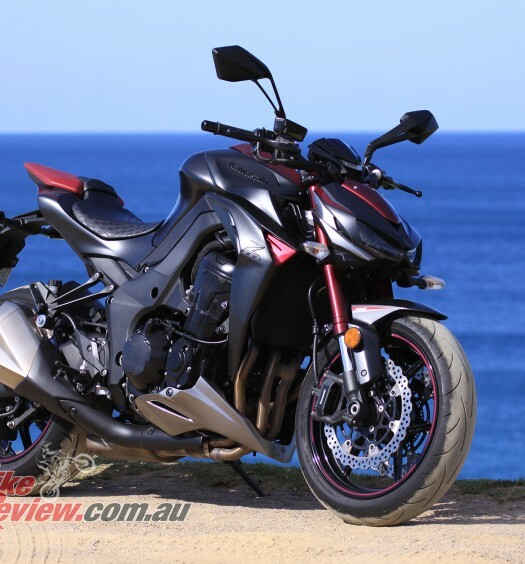 Overall the Z1000 feels extremely strong, with great throttle response and really linear power delivery, with the only quirk being a noticeable kick between 2000 and 3000rpm in first gear picking up and dropping off the throttle mainly in heavy traffic. Once moving however the engine provides great power, comfortably carving up the roads past the 7000rpm mark to make the most of the awesome intake howl and get the hoon factor going. You’re certainly rewarded for keeping the revs up, despite being able to cruise around with just the first light in the horizontal tachometer visible (just over 3000rpm). In fact the deep rumble of the engine, that develops into a real howl at higher rpm can be partially attributed to the resonator added in the airbox which assists in keeping noise down at low rpm (so you can cruise past those Coppers), while enhancing that howl when you open the throttle in anger, particularly with the help of additional intake passages. 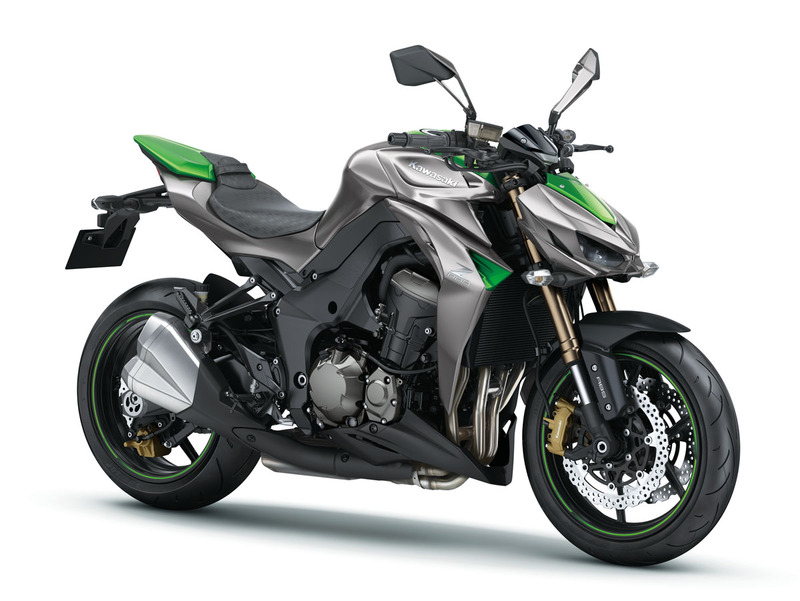 The 2014 Z1000 makes use of the same aluminium twin-tube frame with the engine as a stressed member, that is a cast five-piece assembly and uses four engine mounts, three of which are rigid, while the fourth is a rubber upper rear crankcase mount. The rear sub-frame is now a three-piece aluminium die-cast one, which is both thinner and shorter than the previous version. The frame serves to reach the ideal balance for handling with confidence, while also maintaining the aim of mass centralisation. 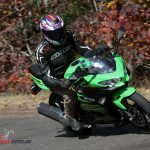 Kawasaki were also happy to boast that the current wheels are six-spoke supersport style offerings, saving 1.5kg over the previous model wheels, while tyres were developed with Dunlop for the Z1000 and a great stock offerings for all round riding, with good wet grip and inspiring confidence in all conditions. 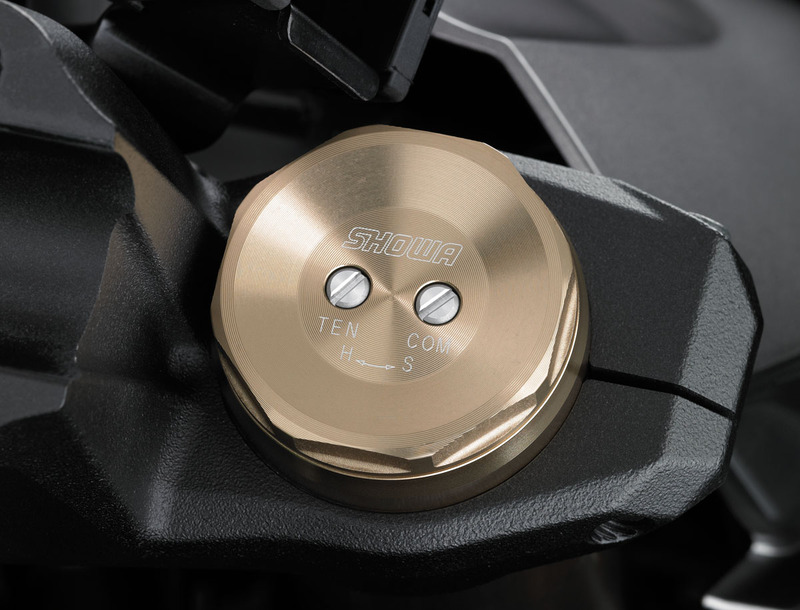 Apart from them being fully visible the Z1000 is now equipped with Showa Big Piston, Separate Function Forks with preload and damping both easily adjustable. Rear suspension is a horizontal back-link setup, assisting in mass centralisation of weight and reducing the amount of heat transferred from the exhausts, as well as being rebound and preload adjustable. Overall the bike feels extremely nimble but is definitely leaning towards sportier, perhaps even more track orientated riding. Spending shorter periods of under an hour on the bike it isn’t such an issue, but doing a 400km testing loop the quite firm suspension did become harsh over rough Australian roads, taking away my level of confidence in the bike, which is a real shame as it’s otherwise a great package that really begged to be pushed. My fully laden riding weight being only around the 70kg mark might have been part of the problem but the spring rates and damping rates are very firm and perfect on smoother roads, just not so good for Aussie bumpy roads where this bike will spend most of its life. The bike was however a fast steering and very settled on the throttle and brakes across good road surfaces, including in the incredibly poor weather we had during the week of testing, with great feedback on wet and slippery roads. One noticeable change to the new Z1000 is of course the addition of the Tokico radial-mount four-piston monobloc calipers with differentiated piston diameters of 32mm and 30mm. New brake pad material further assists in providing stronger bite, stopping and good feel, while a radial-pump master-cylinder with a larger piston and revised lever ratio help ensure that feel. The clear fluid reservoir is also a nice touch. The calipers mate with larger 310mm front petal brake rotors for a stylish look, although whether the gold calipers front and rear add too or detract from the bike’s looks is a personal matter. On the rear a single-piston pin-slide caliper grasps a 250mm petal rotor and is underslung complete with a torque rod. The model provided to us was also the ABS version, with the stopping power in the front brakes taking me back during the first ride, causing the ABS to kick in once or twice until I sorted just how much pressure needed to be applied at the lever – it’s certainly a lot more sensitive than I’m used to! Both front and rear braking was good, with the front providing plenty of stopping power and bite, as well as good feel at the lever, with a minimum of lever movement. The rear was also strong and had good bite, perfect for round town riding and crawling along in heavy traffic. 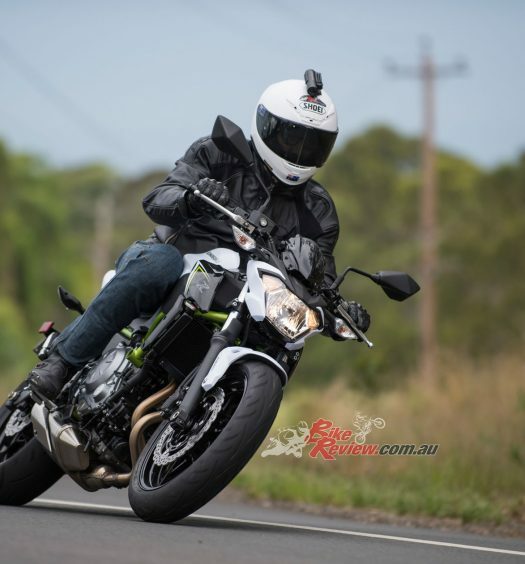 Kawasaki have really nailed in with this new Z1000, the suspension may be a little firm for the terrible road surfaces we are afflicted with in Australia, but this is the only area I could fault the Z1000 in and is an easy fix. Styling from every angle was inspiring and the finish quality is exemplary, with great attention to detail and really nice features including the headlight, mirrors, controls, mufflers and revised seating position. 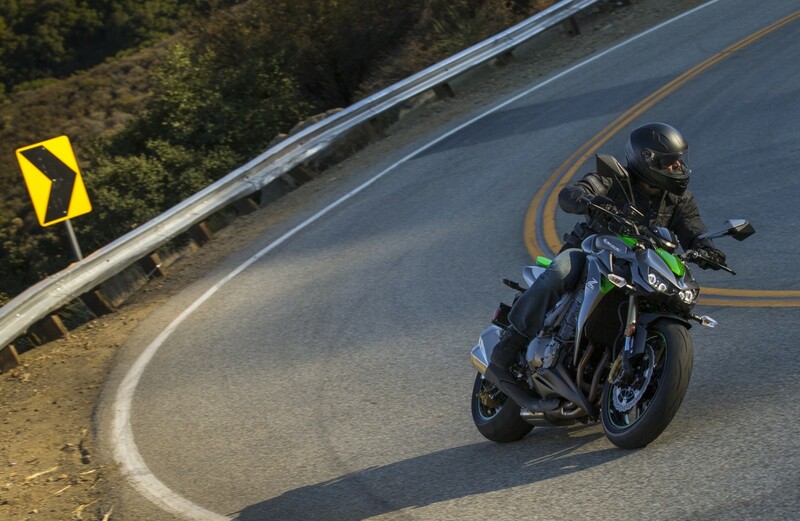 The Z1000 provides good ergonomics, with a sportier position than many of the other naked options I’ve tested and combined with the engine is a joy to ride, with plenty of power on tap and a grin inducing roar. Really opening the throttle was also good for the soul, as long as you have a good grip, as the bike tries to leave you behind, while the bike’s nimble handling through the twisties provided for plenty of fun, even without going insane on the throttle.